Our blockchain consulting arm at Decentral has been involved with Deloitte and the Rubix team for almost a year now, providing them with blockchain expertise and teaming up to run community and blockchain and decentralized tech events. 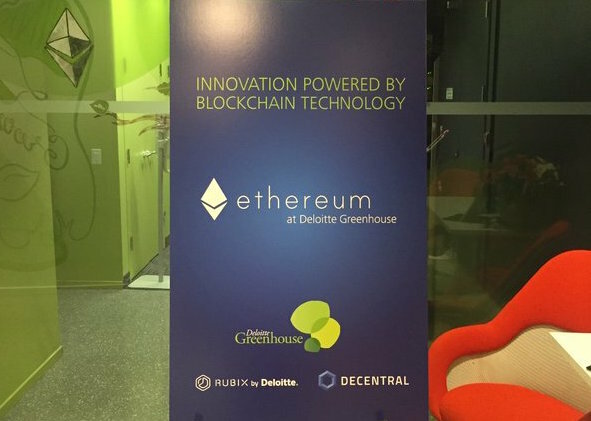 Last night on December 2nd, Deloitte and Decentral partnered to hold an Ethereum event at their Greenhouse space in downtown Toronto. The Greenhouse is a place designed to help Deloitte clients experience breakthroughs through innovative means – to give them that ‘aha!’ moment when they’re stuck in one mode of thought or just going round and round in circles. Deloitte gets that innovating is not as simple as ‘going and doing it’; sometimes it’s not obvious where or how to begin. Events at the Greenhouse aim to spark new ideas by disrupting ordinary ways of approaching problems. It was an ideal venue for us to introduce Ethereum to some of their clients. Deloitte invited banks including CIBC, RBC, and TD, technology firms D+H and Teranet, and the TMX group. When great minds from these sectors begin to understand Ethereum and its disruptive potential, new, brilliant ideas are bound to be generated. Attendees had the chance to hear how Ethereum enables developers to build the next generation of distributed applications and what are some of the strategies they need to be adopting to prepare for the inevitable disruption. The event started with Vitalik Buterin, the creator of Ethereum giving an overview of his brainchild and how its blockchain works. Vitalik joined us via a BeamPro robot-proxy, which he was remotely controlling from Switzerland! This was followed by a talk from our CEO and Ethereum co-founder, Anthony Di Iorio. Anthony emphasized that decentralization is the key to understanding what is happening. Blockchains have made it possible for secure systems to exist without a central authority, giving individuals more power and increasing the system’s resilience. Decentralization can also unbundle services and products and firms need to anticipate for what is coming and prepare accordingly in order to not be rendered irrelevant and obsolete. Implementing changes might well be costly, but it would be far more costly to be idle. Anthony’s presentation highlighted some of the steps firms should be taking to begin this transformation, and also identified some of the opportunities that will open up. Jeff Coleman from Ledger Labs then spoke about ‘smart blockchains’ and the advantages of developing and using the technology. Platforms like Ethereum offer far more flexibility and extensibility than more static platforms. Jeff’s talk was quite comprehensible, considering the audience was not primarily from a tech background. The evening concluded with a talk from Joseph Lubin of ConsenSys – also an Ethereum co-founder. He joined us from New York by taking over the robot-proxy from Vitalik. Joseph gave a talk on dApps and gave substantial information about what ConsenSys is building on Ethereum. During the Q&A session, he gave the audience an interesting perspective on New York’s ‘Bitlicense’ and how a lot of firms – including some of his startups – are considering locating elsewhere. Decentral was established to promote decentralized technologies and a large part of what we do is helping enterprises take advantage of the opportunities that these technologies generate. It was a motivating experience to see traditional financial institutions paying interest in this area, and we are looking forward to more of them actively engaging with Toronto’s thriving decentralized technologies community. See the event updates on our Twitter here or by searching #EthereumAtTheGreenhouse.